After a hot and sunny Christmas day, we had a few days of rain that brought the temperatures down, much colder than a normal summer, so I took the chance to layer up a little! Also got to wear my Christmas present, my new LV speedy bag! As it's a new year, a new start, I've finally gotten around to doing a wardrobe inventory...pretty scary numbers! I'll post about it on Wednesday, and I thought I'd include a link up. I figured I wouldn't be the only person wanting to streamline their wardrobe this year, so hopefully you can take a count of what you own and post about it this week for the link up on Wednesday. The numbers of what I own even surprised me! I'll share more in a couple of days. We had a really relaxed Boxing Day, after a busy Christmas day. We didn't go anywhere, so I didn't get a blog pic, although I did share what I was wearing on instagram as part of the DAREcember style challenge. After a quiet day playing with all of baby's new toys, we ventured out the next day to visit family for some birthday celebrations, and this is what I wore. The rain had set in and brought the temperature down, so I layered up a little. Didn't expect to still be wearing scarves in the middle of summer! Was pleased for the cool change to let me wear them though. This maxi skirt probably wasn't the best choice, as I was dodging puddles trying not to get the lighter pink section wet! It was a good excuse to use my new Louis Vuitton speedy bag that I got for Christmas though - the damier ebene is perfect in the rain. I got the bracelet for Christmas too, an outfit accessorised with new items that worked with the style challenge theme for the day. 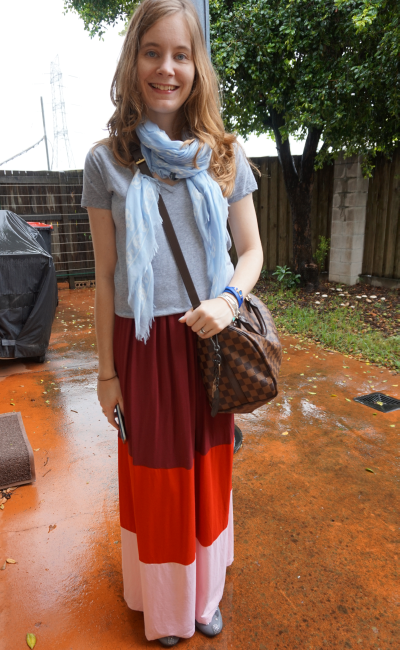 Last worn: Alexander McQueen skull scarf, grey tee, Asos colour block maxi skirt, Marc by Marc Jacobs studded mouse flats. First time I've worn the bag. Hubby invited one of his mates over for lunch and a bit of golf at the driving range. Baby T and I didn't go golfing, but it was nice to spend a little time with his friend. It was another wet and rainy day, so again I took advantage of the cooler temps to layer a bit. I decided to give this bright tank under a zipper detail tee thing a try that I'd talked about last time I wore this grey tee. Very similar to the last time I wore it, just with the different zipper placement and a scarf! Definitely want to try this again next time I wear it, think I've found the purpose for the zippers now ;) The top is still available at the iconic as well if you're thinking about cooler autumn temps already - it's on sale. The humidity cranked up a bit in the afternoon, so shorts were a good choice. Hubby really liked this outfit too, he complimented me on coordinating the pink scarf and tank together! The style challenge for the day was 'on your head' and I was so jealous of the ladies who participated with a sun hat - I'd been hoping to do that and spend some time by the beach, but ended up just putting a messy bun 'on my head' instead as it was definitely not beach weather. Last worn: Alexander McQueen pink skull scarf, grey tee, denim shorts, Acne Pistol boots, Louis Vuitton speedy B (see above). Linking up with Let It Shine, Modest Monday, Style to Inspire, Mix It Mondays, Manic Monday, Real Mom Style, Confident Twosday, Style Sessions, Trend Spin Linkup today. Pretty looks! Love your smile! You always look energetic! I love your skull scarf. It's so cute! I have a similar one in black and white! I always love when you wear that maxi skirt! It is so fun! I hope that you had a wonderful New Years! I love the maxi skirt! Those colors are great. Always the way isn't it? Rain and a floor-skimming maxi is never the best combo. think I'll need to wear boots next time haha! You have great legs to pull of jean shorts! My legs get cold easily so you would rarely see me in bare legs unless its really warm (and even then I sometimes prefer wearing long maxi skirt like you do too haha). I love the Alexander McQueen scarf! I find my legs get colder easily too, that's why I tend to keep the shorts for summer only...but some days it's not too chilly if I'm bundled up every where else :) Only a few days a year though, not a look I can wear often. Wish I owned some of these items! Love how you put them together, and I neeeed that LV bag! I can't imagine a hot and sunny Christmas day! I love both looks but the first with grey and light blue is lovely and fresh on you. You look lovely. haha I am very lucky to have him! :) I'd love to see your beauty inventory too! That bag is so fabulous! I love the layering in the second look. That bright tank underneath is perfection! You have the best scarf collection, lady! And I think that skirt is trying to taunt me because I love it and it's the second time I've seen it in 24 hours! You look great in it! haha yes that's why my maxi skirts get a work out in summer - skip a day of shaving, haha! Lovely scarf! It's on my wishlist!!! :) I can't decide which outfit is my favorite! Love them both, so casual chic! Once again you have the cutest light-weight scarves like that gorgeous Alexander McQueen one. I adore that color-blocked maxi every time you wear it. The second outfit is my fave though and I would wear it in a heartbeat! Love those skull scarves! I have been a fan for years! Looove that color block skirt! loving these casual looks and i love your purse! i have the one without the straps for crossbody... i like yours a lot! you look very pretty in both outfits! also, wow, you have awesome legs! I can relate to the hot weather ! It's summer here too ! I like the second look, shorts and boots are not a possibility for me, they just don't work.